A postcard depicting the inside of La Iglesia de San Francisco de Antigua Guatemala, also known as San Francisco el Grande and the San Francisco Church, which was built by Diego de Porres in 1702. It is the home of the Franciscans of Guatemala, who have been in the region since 1525. 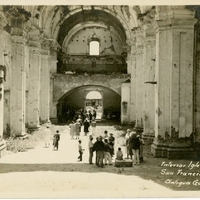 “Interior Iglesia San Francisco, Antigua, Guatemala Postcard.” RICHES of Central Florida accessed April 25, 2019, https://richesmi.cah.ucf.edu/omeka/items/show/6644.